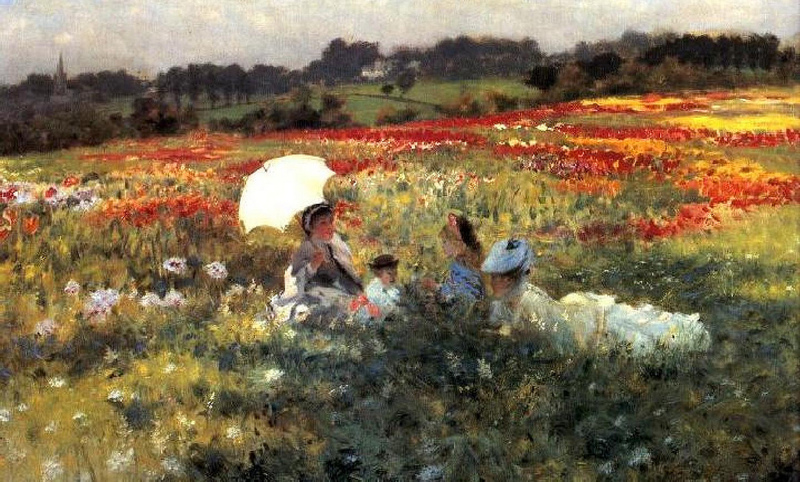 Giuseppe De Nittis (1846–1884), In the Fields around London (date not known), oil on canvas, 45.1 x 54.9 cm, Private collection. Athenaeum. By 1880, De Nittis was well-established and commercially successful, as I have explained in the previous article in this series. Artistically he had extensive contacts in London, Paris, Naples, and beyond. He remained friends with several of the core Impressionists, although Monet seemed happier dealing with him as a patron and collector than as an artistic colleague. He, his wife and family socialised with other Impressionists, particularly Degas and Caillebotte, and with the small group of Italian Impressionists in Paris. Although his paintings varied in their facture, when sketching or painting works which were not intended for public exhibition, he could be very painterly indeed. However, he could equally be quite tightly realist, for instance when producing canvases for the Salon or other exhibitions in which brushstrokes were still not quite proper. Technically he was extremely skilled, capable of matching the most able of the other painters of the day. He showed five paintings at the National Exposition in Turin in 1880, which were very well received. Among them was one, The Passing of a Train, which remains the most difficult to date. 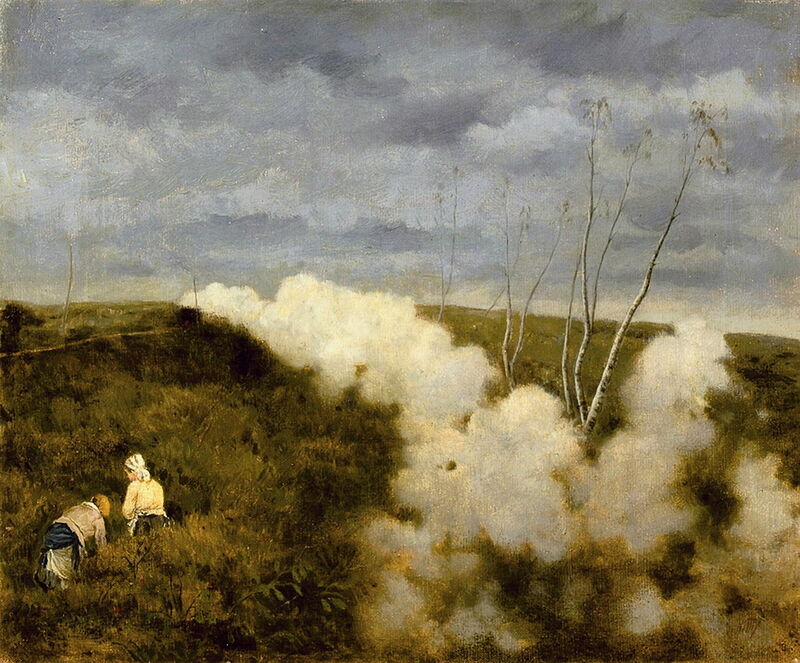 Showing a classical Impressionist motif, a steam train in the country, it has the tight realism more typical of his early years, and some have dated it as early as 1869. However it seems strange that, if painted then, he should have shown it as late as 1880. Giuseppe De Nittis (1846–1884), The Passing of a Train (between 1869 and 1880), oil on canvas, 31.1 x 37.6 cm, Private collection. Wikimedia Commons. 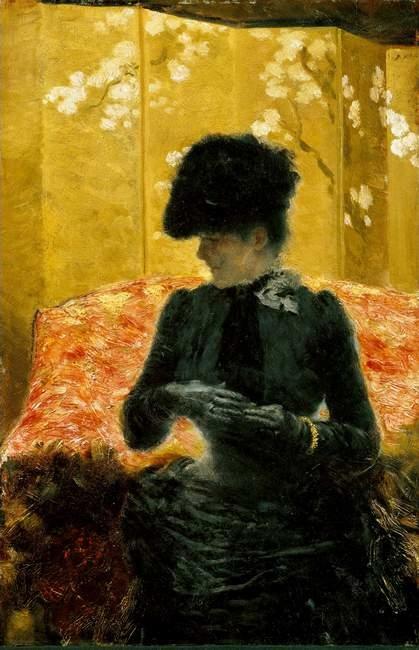 Giuseppe De Nittis (1846–1884), Lady on a Red Divan (c 1880), oil on wood, 41 x 27 cm, Private collection. Athenaeum. More typical is this oil sketch, Lady on a Red Divan (c 1880). A number of his winter landscapes have been dated to 1880, although again some may have been painted earlier. 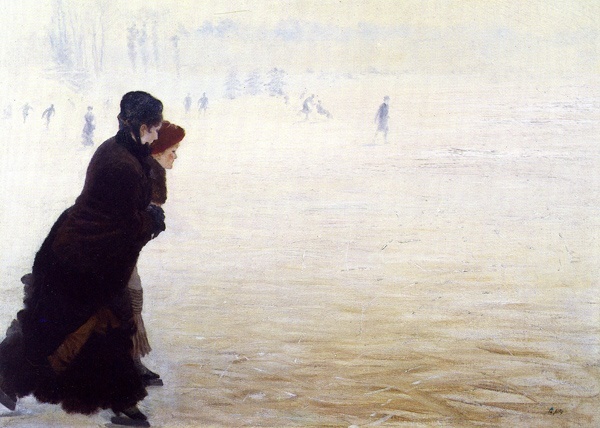 Giuseppe De Nittis (1846–1884), The Skating Lesson (after 1875, probably c 1880), oil on canvas, 55 x 74 cm, Private collection. Athenaeum. 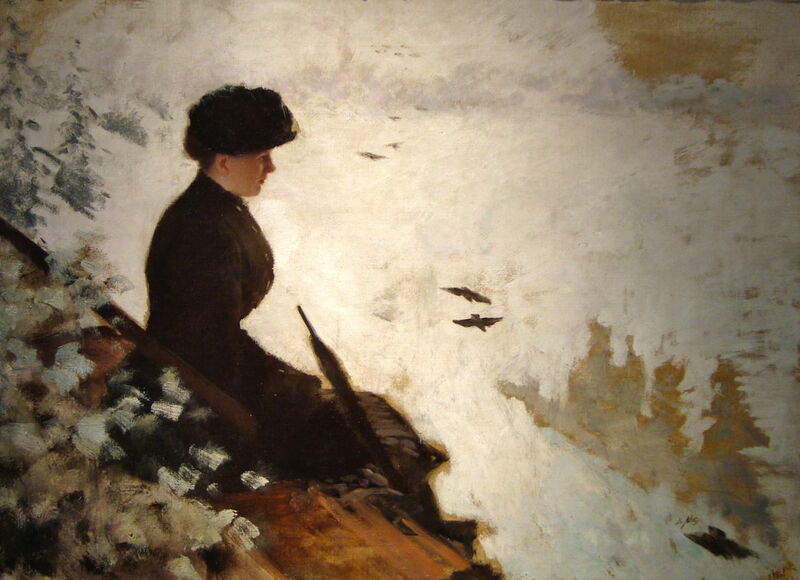 Giuseppe De Nittis (1846–1884), At the Lake (1880), oil on canvas, 73.5 x 54 cm, Pinacoteca Giuseppe De Nittis, Barletta, Italy. By LPLT, via Wikimedia Commons. 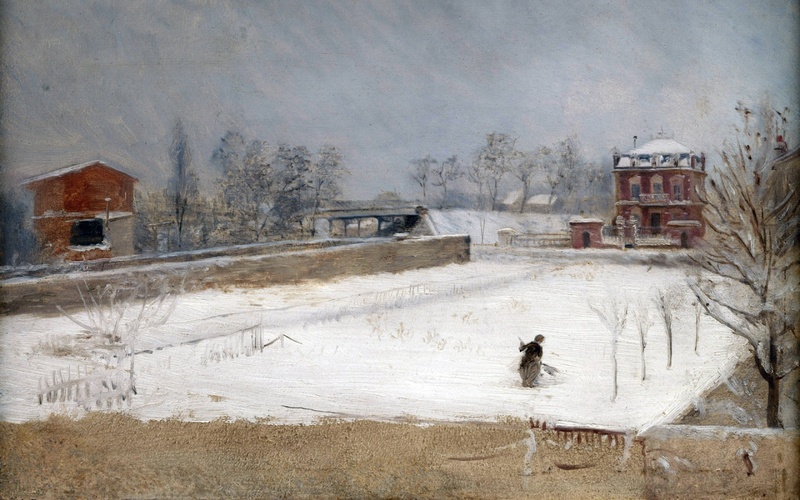 Giuseppe De Nittis (1846–1884), Snow Scene (1880), oil on canvas, 54 x 73 cm, Pinacoteca Giuseppe De Nittis, Barletta, Italy. By LPLT, via Wikimedia Commons. Giuseppe De Nittis (1846–1884), Winter Landscape (c 1880), oil on wood, 21.4 x 26.8 cm, The Gere Collection, The National Gallery, London. Athenaeum. The following year, 1881, seems to have been quieter, with only one notable exhibition, of pastel works with the Circle of Mirlitons. 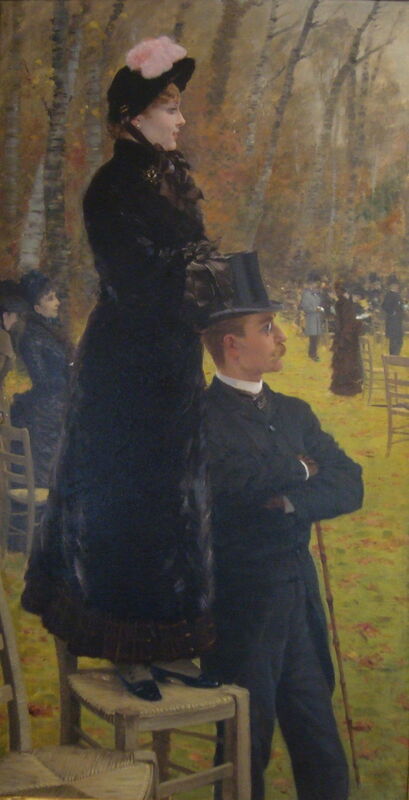 Giuseppe De Nittis (1846–1884), At The Races at Auteuil on the Chair (1881), oil on canvas, 107.5 x 57 cm, Pinacoteca Giuseppe De Nittis, Barletta, Italy. Athenaeum. 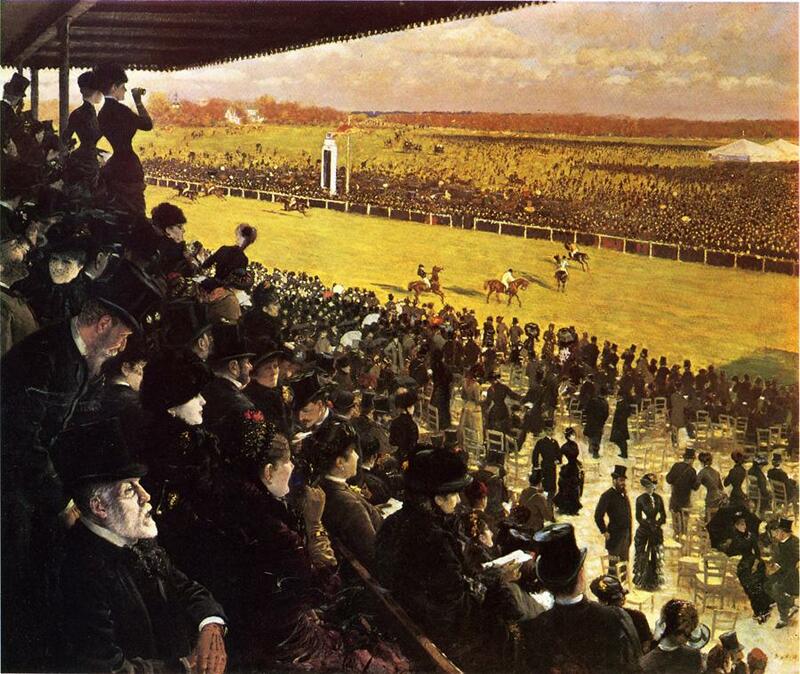 He painted more at the horse races, including At The Races at Auteuil on the Chair (1881), and it is thought that this was the year that he painted his exceptional and thoroughly Impressionist In the Fields around London, although dates as early as 1878 have been proposed for that. Giuseppe De Nittis (1846–1884), In the Fields around London (c 1881), oil on canvas, 45 x 55 cm, Private collection. Athenaeum. 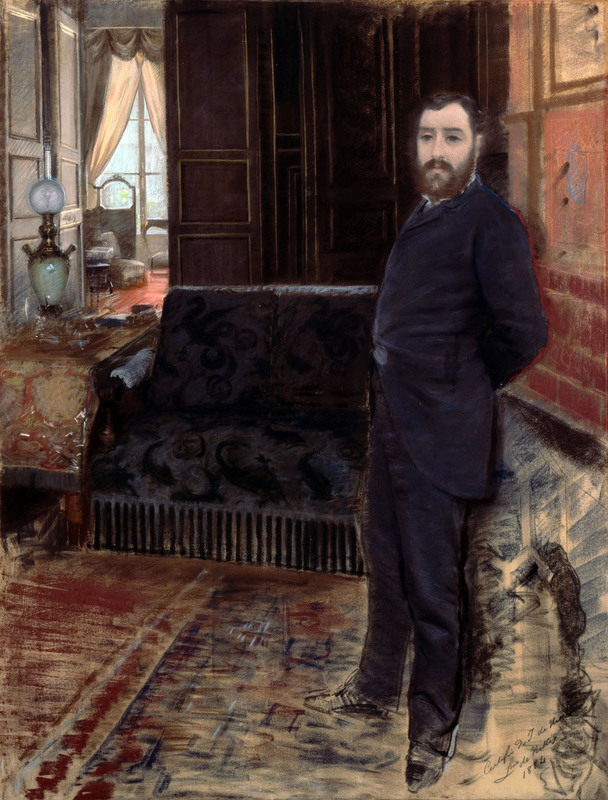 In 1882, he was in London for a time with James Tissot and Bastien-Lepage, and had his first exhibition at Georges Petit’s gallery in Paris, as part of the first Exposition Internationale which he had helped Petit to plan. Giuseppe De Nittis (1846–1884), The Place du Carousel Courtyard and the Tuileries in Ruins (1882), oil on canvas, 45 x 60 cm, Musée du Louvre, Paris. Wikimedia Commons. 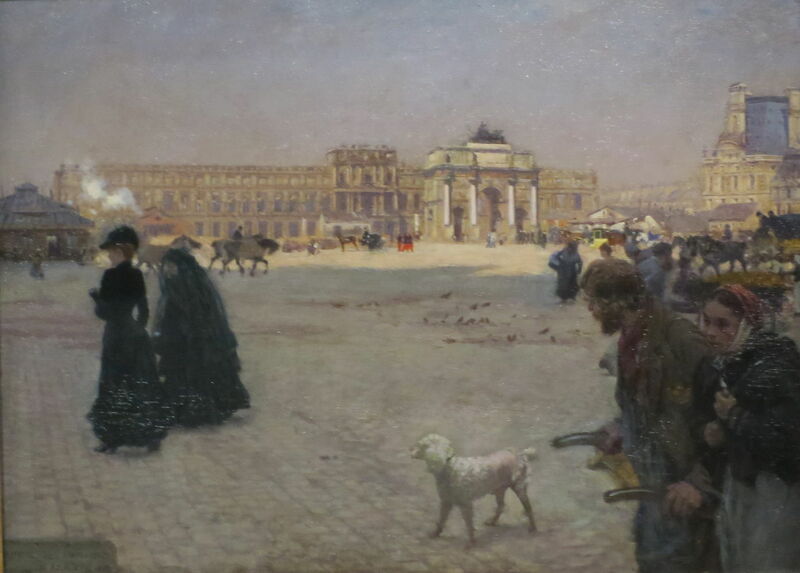 A second exhibition at Georges Petit’s Exposition Internationale followed in 1883, and the Musée du Luxembourg, Paris, purchased his The Place du Carousel Courtyard and the Tuileries in Ruins, now in the Louvre. 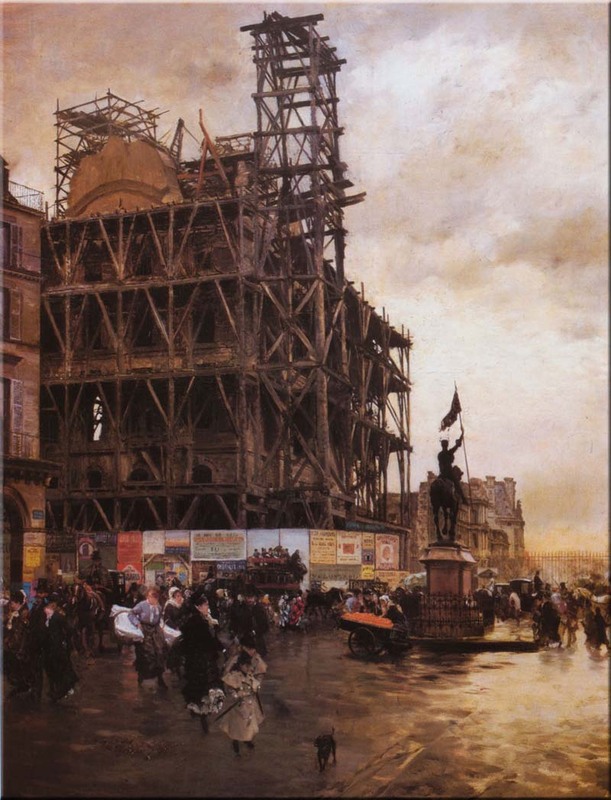 The same museum wished to purchase his Place des Pyramides but could not afford to; De Nittis bought it back from Goupil and made a gift of it, from where it has now passed to the Musée d’Orsay. De Nittis visited Naples again, where he was saddened to discover copies of his Place des Pyramides being offered for sale. Giuseppe De Nittis (1846–1884), Place des Pyramides (c 1883, but could be as early as 1875), oil on canvas, 92.3 x 75 cm, Musée d’Orsay, Paris. Wikimedia Commons. Giuseppe De Nittis (1846–1884), Self Portrait (c 1883), pastels, 114 x 88 cm, Pinacoteca Giuseppe De Nittis, Barletta, Italy. Athenaeum. 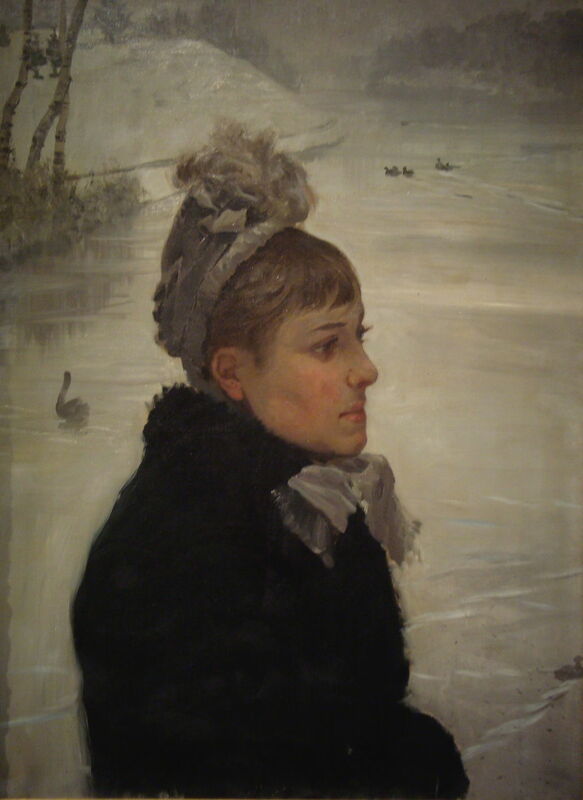 This pastel Self Portrait probably dates from 1883. Giuseppe De Nittis (1846–1884), The Races at Longchamps from the Grandstand (1883), oil on canvas, 100 x 120 cm, Private collection. Athenaeum. This very ambitious painting of the horse racing at Longchamps was preceded by at least one pastel study. He also painted some quite intimate scenes from the social lives of the famous, including Princess Matilde entertaining in her ‘living room’. 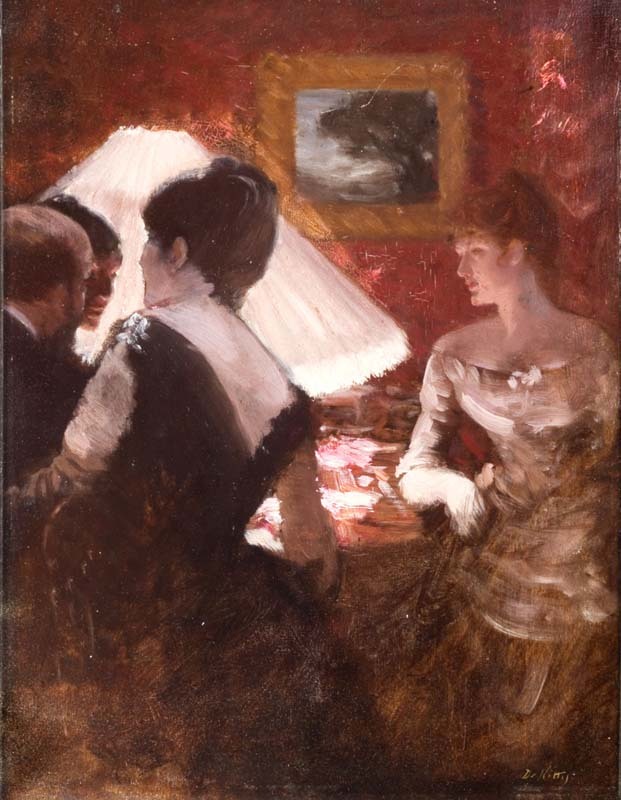 Giuseppe De Nittis (1846–1884), In the Lamplight (c 1883), oil on wood, 35 x 26.5 cm, Galleria d’Arte Moderna Ricci Oddi, Piacenza, Italy. Athenaeum. Giuseppe De Nittis (1846–1884), The Living Room of Princess Matilde (1883), oil on canvas, 73 x 91 cm, Pinacoteca Giuseppe De Nittis, Barletta, Italy. Athenaeum. 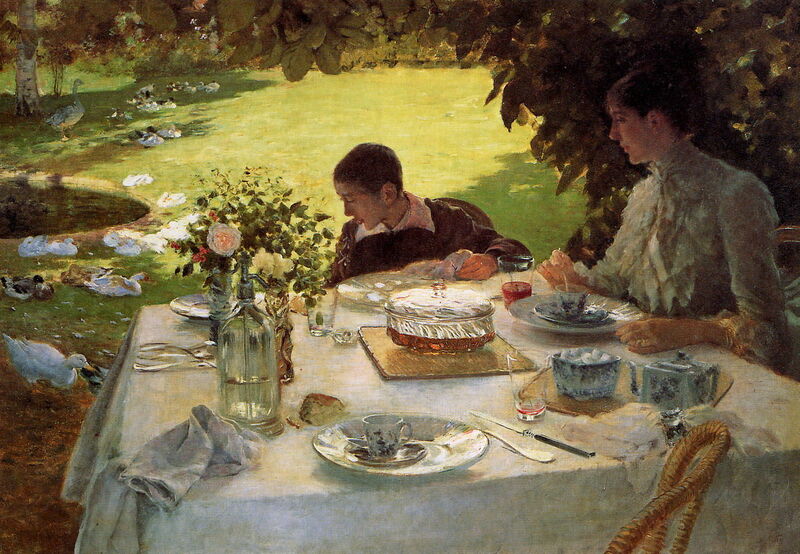 In the Spring of 1884, he painted what was probably his most technically accomplished work, Breakfast in the Garden, in which his wife and young son are seen enjoying an open-air meal. His treatment of the reflecting surfaces of the glass, china, and metal is superb, comparable perhaps with the likes of Janet Fish in recent years. However the ducks and garden behind are wonderfully painterly, and show his control over facture. Giuseppe De Nittis (1846–1884), Breakfast in the Garden (c 1884), oil on canvas, 81 x 117 cm, Pinacoteca Giuseppe De Nittis, Barletta, Italy. By LPLT, via Wikimedia Commons. 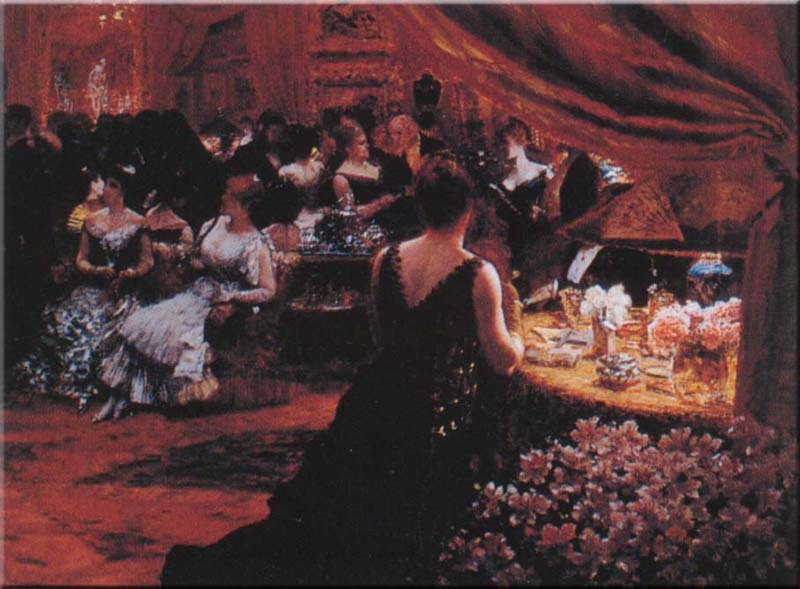 This was one of three paintings which he had accepted for the Salon of 1884. However he died suddenly of a cerebral haemorrhage (stroke) on 21 August 1884, at the age of just 38. The Galerie Bernheim Jeune, Paris, held a memorial exhibition in 1886, and his works featured in the Venice Biennale in 1901, 1914, and 1928. His major retrospective exhibition was held in his home town of Barletta in 1934. In the next article I will show paintings which are probably correctly attributed to him, but which I have been unable to fully verify. Angiuli A (2007) Guida Rapida, Pinacoteca Giuseppe De Nittis, Palazzo della Marra, Electa Napoli. ISBN 978 88 510 0402 6. Belloli M & Lamacchia G (2007) Il Dossier De Nittis, Un maestro dell’Impressionismo nella documentazione degli Archives Nationales de France, Stilo Editrice. ISBN 978 88 87 78173 1. Monti R et al. (1990) Giuseppe De Nittis, Dipinti 1864-1884, Artificio. ISBN not given. Sperken CF (2007) Giuseppe De Nittis da Barletta a Parigi, Schena Editore. ISBN 978 88 82 29708 4. Posted in General, Painting and tagged de Nittis, Degas, Goupil, Impressionism, Italy, Macchiaioli, painting, Petit. Bookmark the permalink.